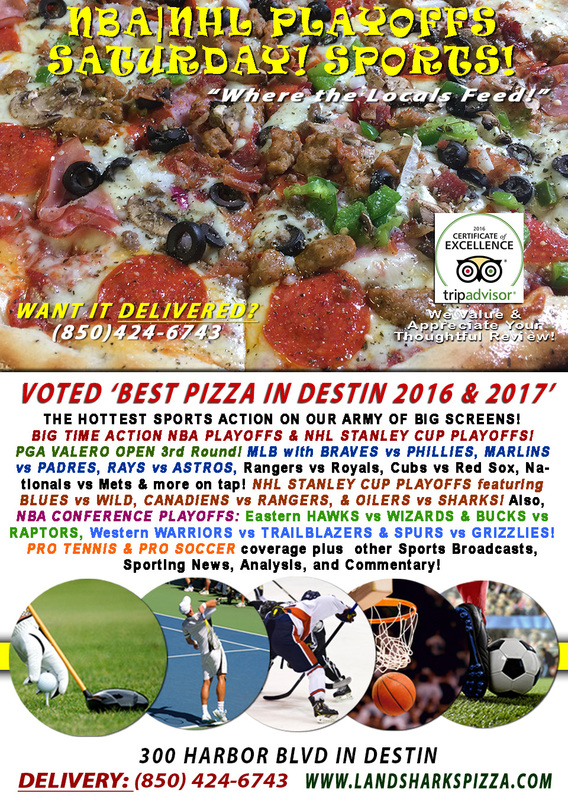 / Best Pizza In Destin Florida / FOOD CITY 500 $8 Pitchers & More|PGA Valero Open SUNDAY Finale, MLB, NBA & NHL PLAYOFFS! FOOD CITY 500 $8 Pitchers & More|PGA Valero Open SUNDAY Finale, MLB, NBA & NHL PLAYOFFS! 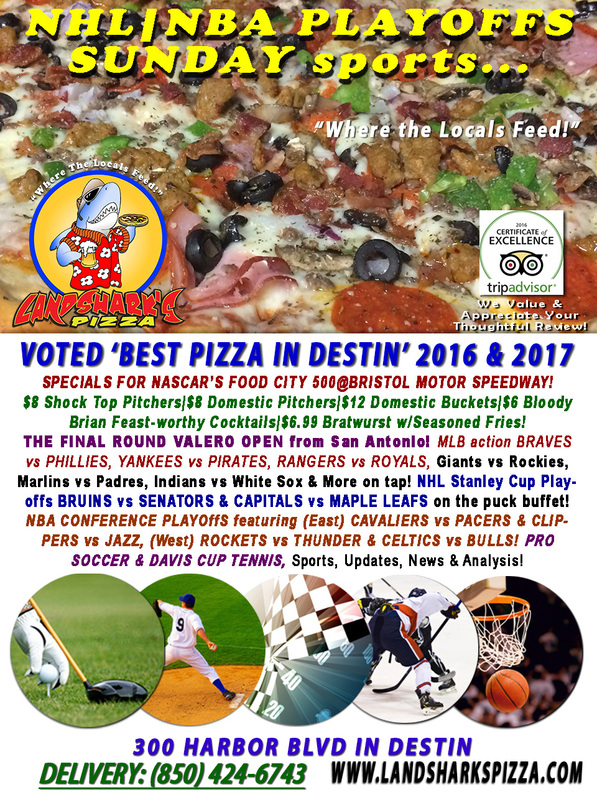 Time to kick back and relax in Destin with exciting final round golf, basketball playoffs and hockey playoffs with the ‘BEST PIZZA IN DESTIN’, a belly-busting menu of delicious eating, and a full bar! SPORTS ON OUR ARMY OF BIG SCREENS – NASCAR Monster Energy Food City 500 from Bristol Motor Speedway! THE FINAL ROUND of The VALERO OPEN from San Antonio! 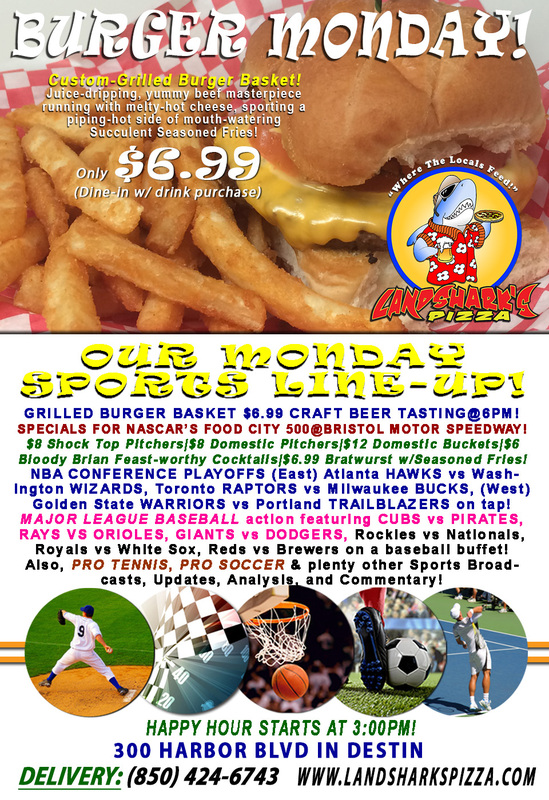 Major League Baseball BRAVES vs PHILLIES, YANKEES vs PIRATES, RANGERS vs ROYALS, Giants vs Rockies, Marlins vs Padres, Indians vs White Sox & More on tap! NBA CONFERENCE PLAYOffs featuring (East) CAVALIERS vs PACERS & CLIPPERS vs JAZZ, (West) ROCKETS vs THUNDER & CELTICS vs BULLS! NHL HOCKEY Stanley Cup Playoffs bringing BRUINS vs SENATORS & CAPITALS vs MAPLE LEAFS on the puck buffet! Also, PRO TENNIS & PRO SOCCER plus plenty of other Sports Broadcasts, Sporting News, Analysis, and Commentary! Previous Post: « NASCAR Xfinity, NHL|NBA PLAYOFFS|PGA Valero Open Super Saturday Sports|Award-Winning Pizza & Wings FULL BAR!